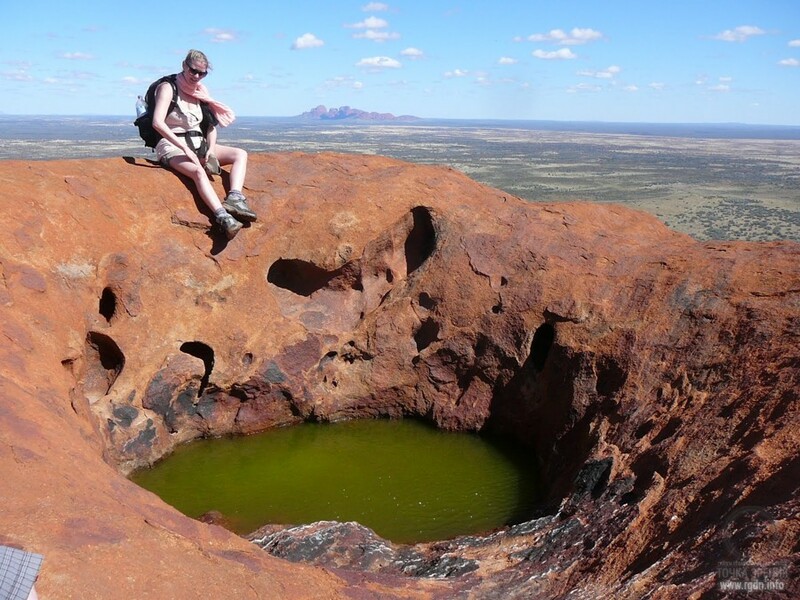 Uluru is located in the middle of the Australian continent, 450 km southwest of Alice Springs. The mountain represents a huge oval hump, 3.6 km in length, 3 km in width, and 348 metres in height. The age of the monolith is about 680 million years. Its base is indented with caves. The mountain is surrounded with isolated desert oaks, eucalyptuses and spinifexes. Typical Australian animals dwell in the Uluru area: kangaroos, emus, marsupial jerboas, dingoes, camels, rabbits, giant monitor lizards, venomous snakes, etc., while the mountain top is inhabited by wedge-tailed eagles. 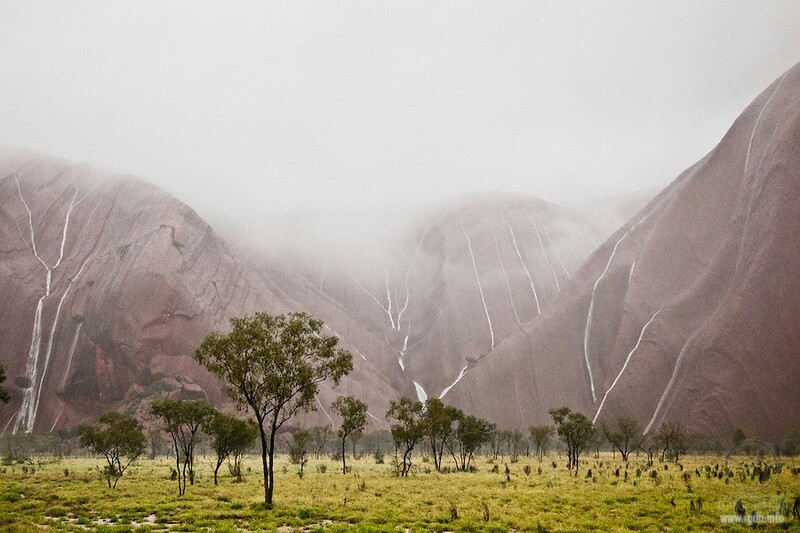 In 1977, Uluru was included in the national-level biosphere reserve, which is the UNESCO World Heritage site. The name origin has not been ascertained, though there are several versions. The word uluru comes from the Aboriginal language and by one of the versions means nothing at all. It is allegedly a surname, family name of traditional owners of lands around Uluru. According to another version, in the Aboriginal language uluru means a “meeting place”. By a third version, in some Aboriginal tribes the monolith name means an “abode of ancestors”. 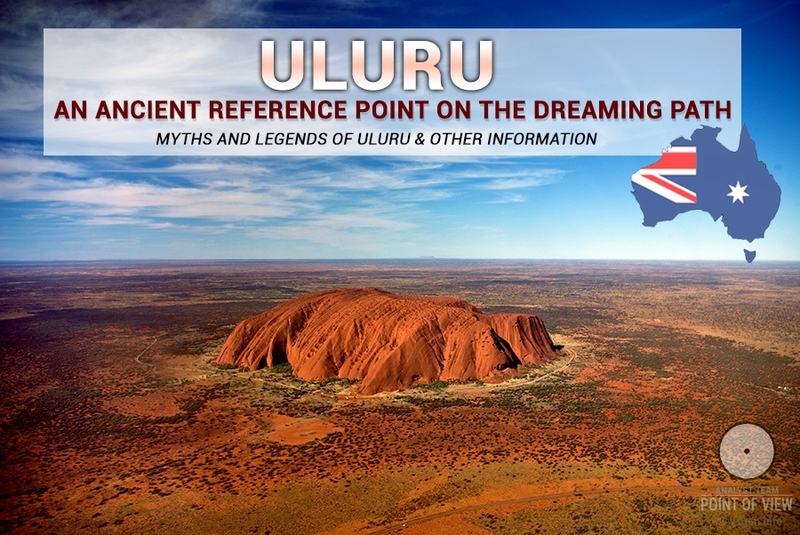 Finally, there is a version that in the Aboriginal language uluru means simply a “mountain”. Such a variety of meanings may indicate the name is very ancient. The first European who saw Uluru in 1872 was Ernest Giles. He noticed the mountain from the side of Lake Amadeus, but he could not reach it. A year later the wonder-mountain was ascended by the English surveyor William Christie Grosse. 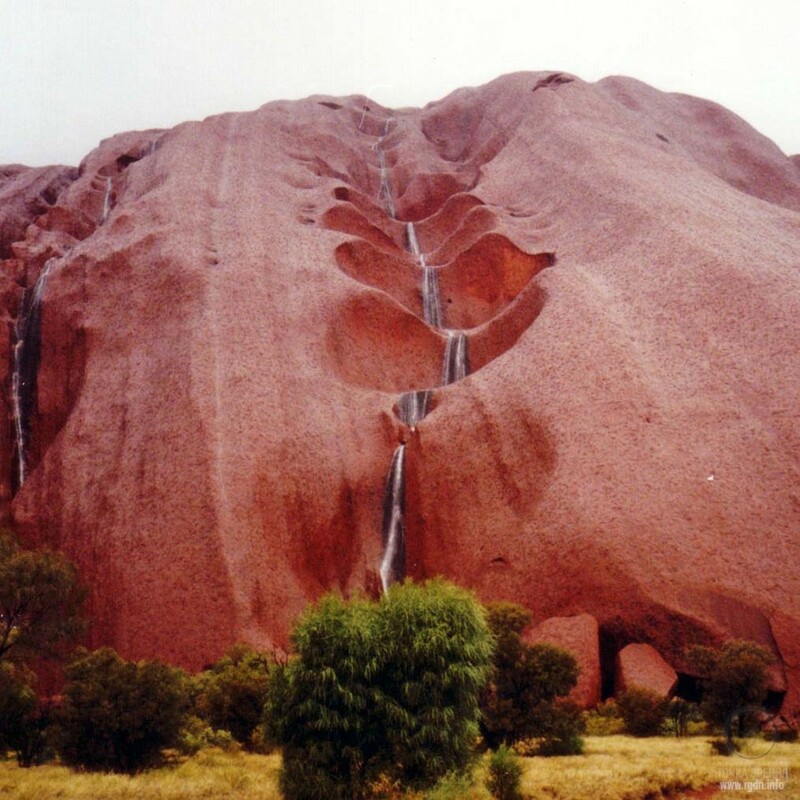 He described and named it the Ayers Rock in honour of the then Chief Secretary of South Australia, Sir Henry Ayers. Thus, the mountain got its second name. Uluru is also called a chameleon. Marvellous colours interchanging during the day depending on sunlight turn this place into an enigmatic natural phenomenon. The monolith rock consists of grey arkosic grit stone that forms due to destruction of granites. Analysis shows it contains feldspar, quartz and iron oxides. Owing exactly to such a set of substances, the mountain changes its colour. 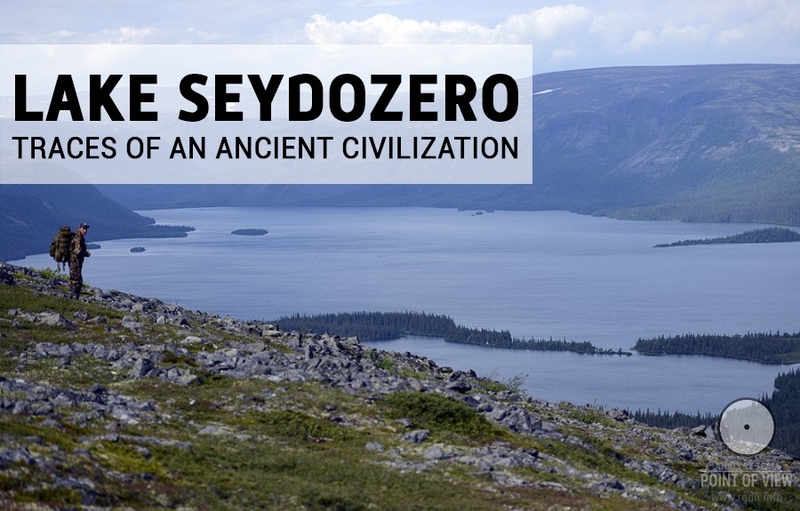 The story of the mountain origin is just as ambiguous as the story of its name. Today scientists suggest diverse theories explaining Uluru emergence. Two most popular versions are given below. Geologists assert the legendary Australian monolith formed of sedimentary rocks at the bottom of nearly dried-up Lake Amadeus. In the middle of the lake there used to be a big island that gradually crumbled, and its parts got pressed at the bottom of this once giant water body. 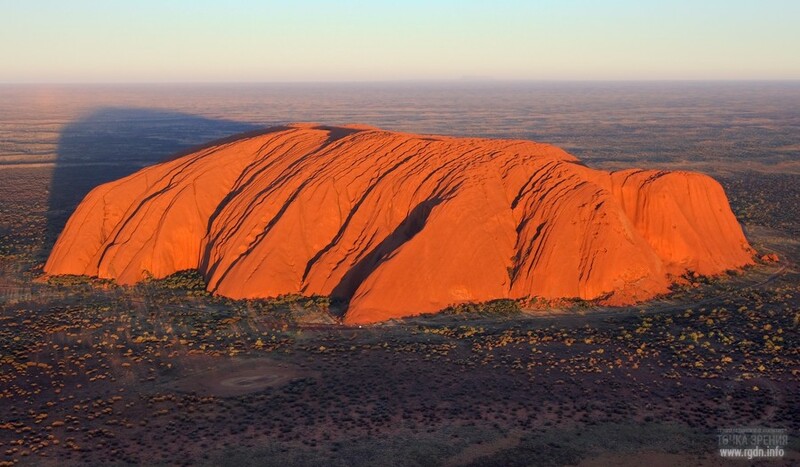 Therefore, over a long period of time the mountain Uluru formed in the very middle of Australia. Other experts believe Uluru is a typical product of erosion – the endless process of destruction of uplands by natural forces and transformation of broken terrain into a plain. Scientists call such more stable rock masses that escaped destruction outliers. They are found in Sahara on Tibesti plateau, in Arabia, and in the Monument Valley in America. A typical outlier is the Sugarloaf Mountain in Rio de Janeiro. 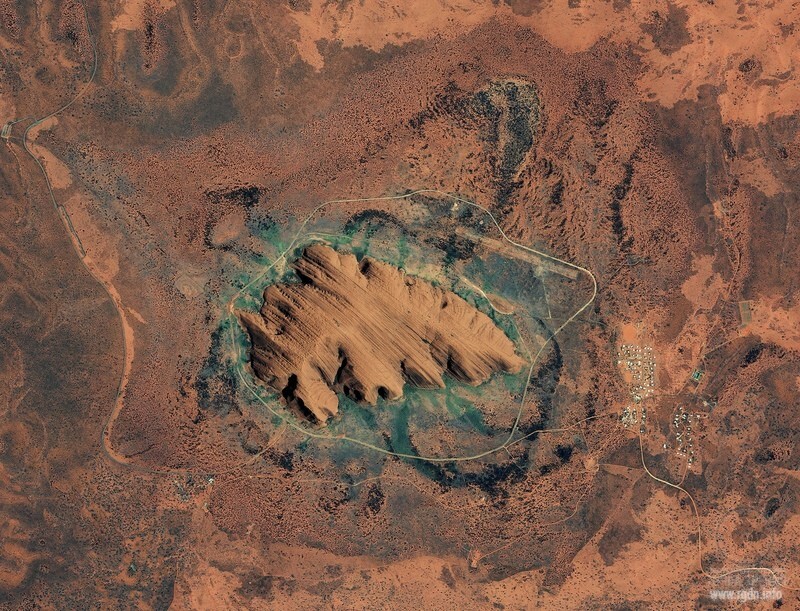 Uluru is an outlier, too; the only difference is that it overshadows all others by its size. In 1985, the Australian government leased Uluru to the local Anangu tribe for 99 years, so Aboriginal Australians are now the official “landlords” there. The inimitable change of colour on the chameleon mountain, which lasts throughout the day, as well as the Uluru mysteriousness attract over 400 thousand tourists to this part of Australia every year. 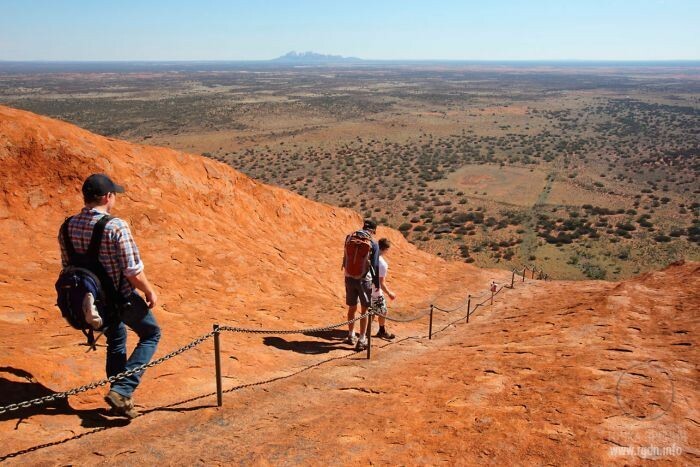 Aborigines don’t prevent tourists from visiting Uluru, having their share in tour earnings. 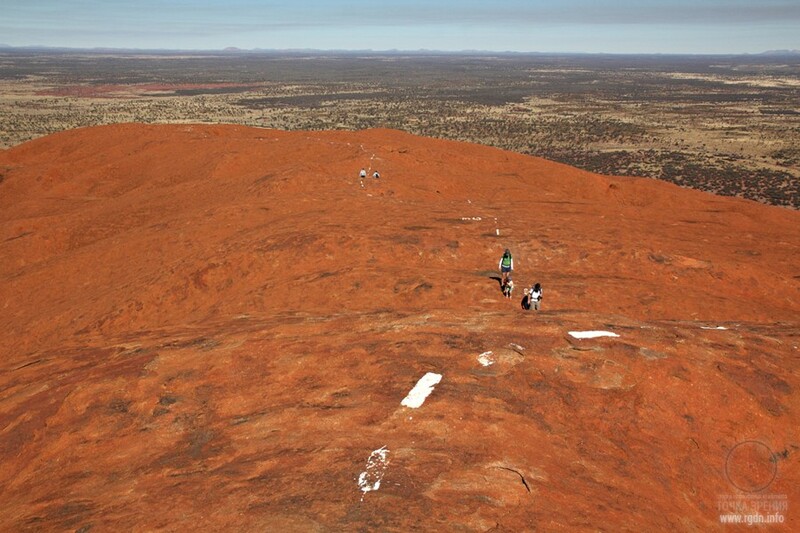 At the same time, the Anangu people repeatedly address the Australian government with a request to prohibit ascents of the mountain, which they consider sacred. Furthermore, the ascent of Uluru is rather dangerous: already 35 people died in attempts to subdue the mountain. Although the aborigines have so far failed to ensure the ascent prohibition, there is a ban that is strictly enforced: in two spots on Uluru where initiation rituals take place it is prohibited to take pictures. Australians call the droughty area of the mountain Australia’s dead heart. However, for the aborigines Uluru and everything around is living. Culture for the aborigines is just a thread in a grand carpet of life, where people, animals, plants, and certainly the mountain are interweaved. Without any exaggeration, Uluru may be called the centre of primeval culture of indigenous Australians. At the foot of Uluru, there is a spring with pure chilling water, which helps Aboriginal Australians to survive in the extreme environment. At the foot of the mountain, there are also caves of up to 800 metres in length and up to 30 metres in height, where numerous aboriginal ritual drawings have remained. For millennia, the survival of Anangu and other indigenous tribes depended on the knowledge of flora, fauna, wind and water. The knowledge was transferred to younger generations in songs, legends and drawings. In aboriginal tribes, ancient legends of the fight between the good sand python Kunya and the venomous snake Lira are still transferred by word of mouth. 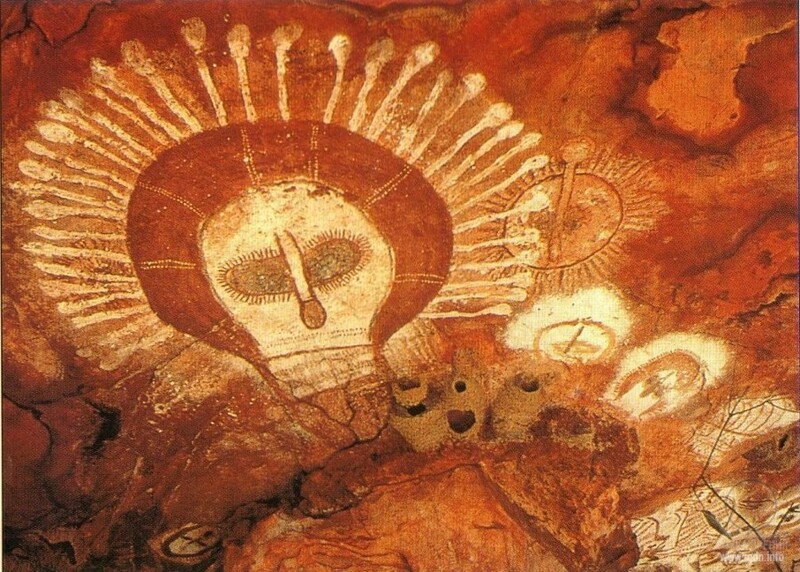 Ancient rock paintings depicting scenes of the fight are shown to children, and contemporary aboriginal artists use the legend in their artworks. 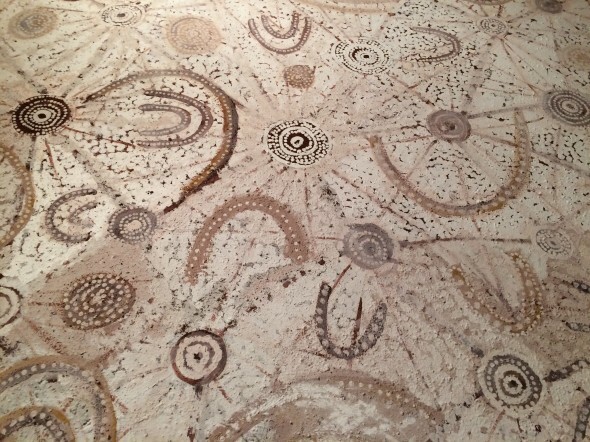 Aboriginal Australians have a unique spiritual tradition typical for nearly all local cultural and ethnic groups – Dreaming. Despite the initial associations arising with this word, Dreaming is much more than physical sleep. It’s a complex system that determines and regulates all aspects of aboriginal life; a scope of practical knowledge of everything around, of ethics, beliefs, rituals and spirituality. In a sense, according to local legends, the reality in which all of us reside is Dreaming, and every person actively participates in the process of Dreaming that started in the Dreamtime (an analogue of the time of the world creation) and continues to this day. A part of the Dreaming knowledge system is the so-called bush medicine. Aborigines use an extensive experimental experience of hundreds of generations to heal by means of herbs, animals and plant extracts. There are also numerous reports on the use of healing spells. According to legends, ages ago during the Dreamtime, powerful gods created mountains, rivers, plants, animals and people, and established traditions. Thereafter, they turned into mountains, stones and trees that became a receptacle of their magic power. Aborigines consider certain caves so sacred that they forbid not just to photograph, but even to approach them. According to legends of indigenous Australians, these caves represent gates to the other world, where only the initiated may enter. Local popular beliefs say Uluru is hollow inside, where deep in stones there is a “source of sacred energy”. Aborigines believe traces on the mountain were left by a huge monstrous dog Kura Punji, which sneaked to a hunter camp to devour all hunters. The people were saved only by the usual human friend – cheerful bird kookaburra that warned them with its shriek about the terrible beast approaching. A local legend says, the tribe Mala (“hare wallaby people”) lived on the sunny side of Uluru, and the tribe Kunia (“carpet snake people”) lived on the mountain’s shady side. Once both tribes were invited by Vindulka tribe to a feast; however, the invitees were attracted to lizard women of the tribe Liru who came to them as guests. Consequently, the hosts of the feast to which nobody came got angry and sent to the tribes-“offenders” fierce hairless dogs with huge teeth (sometimes it is said those were dingoes) and venomous snakes that dwelled near Mount Olga (the Aboriginal name of the mountain is Kata Tjuta). As a result, a grandiose battle took place near Uluru, and both tribes – Mala and Kunia – were exterminated. At that, Uluru rose from the ground and absorbed the souls of the fallen. 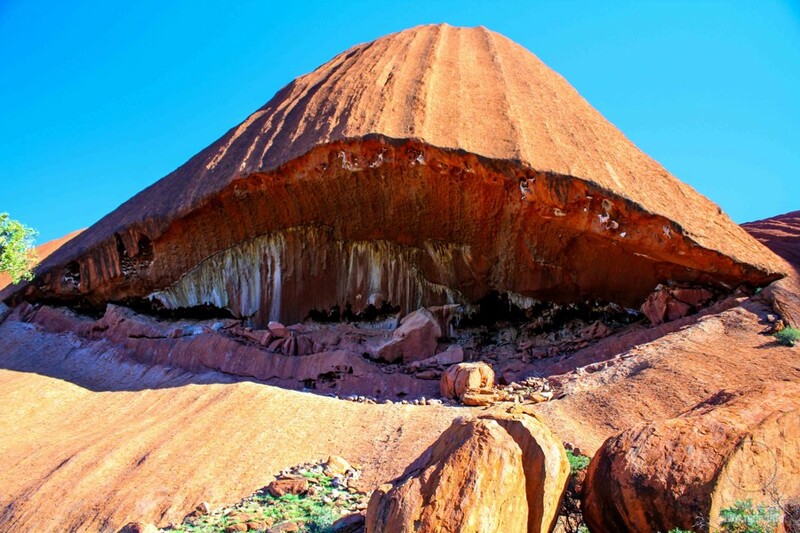 There is a popular belief that one who takes at least a small piece of Uluru will be damned, and many tourists confirm this: after the troubles they had to experience people do their best to mail exported pieces of Uluru rock back to Australia. Tribes that inhabit Western Desert believe Uluru is a mythical animal with its head buried in sand. Once a year at night it raises its head and examines the desert. Shamans identify such day and announce a feast in honour of the sacred mountain. Tribes from all over Australia gather near Uluru. Some of them come in order to touch the rock, ask for diverse amenities and perform a ritual dance. Others consider the mountain to be an abode of hostile spirits. They ask the rock for forgiveness and beg it to forget them and not to bring them troubles. Legend says, Uluru is a reference point on one of “Dreaming Paths” laid by ancestors of the aboriginals when the earth was only forming. During the “Dreamtime”, or Jugura, the area around the mountain was inhabited by the tribes of hare wallaby people and carpet snake people. An aggressive southern tribe of venomous snake people attacked the carpet snakes, and the latter were saved only by the interference of the divine Mother-Earth Bulari worshipped by the hare wallabies. Bulari overcame the conquerors, having inflicted a poisonous cloud of death and diseases on them. Legends of hare wallaby people tell about the time when their tribe got in imminent danger. A rival tribe called the emergence of a savage dingo named Kulpunia with their chants and set it on the hare wallabies. The latter managed to escape only thanks to their remarkable jumping skill. At the very top of Uluru strong winds always blow. 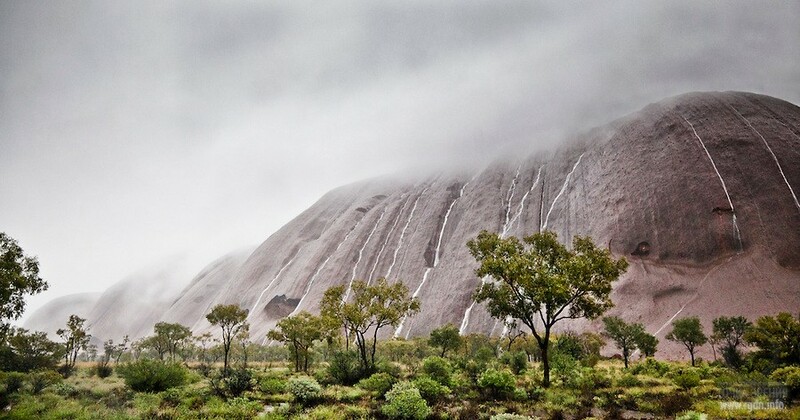 Weather forecasters keep racking their brains over the riddle of Uluru. None of them has so far managed to accurately predict a rain approaching the desert centre, where it actually rains over the sacred mountain only. However, the Aboriginal people feel the rain approaching about a month before and start gradually gathering near the monolith. This phenomenon takes place not even every year. The sun scorches, it's broiling hot, while suddenly the wind starts blowing and the sky gets quickly covered with clouds. A heavy shower starts all of a sudden; it rains for several minutes, then the rain stops just as suddenly, but the water keeps flowing down the monolith for a certain while. Clouds disperse, and in the sunlight the water flows resemble flows of blood dashing from above. 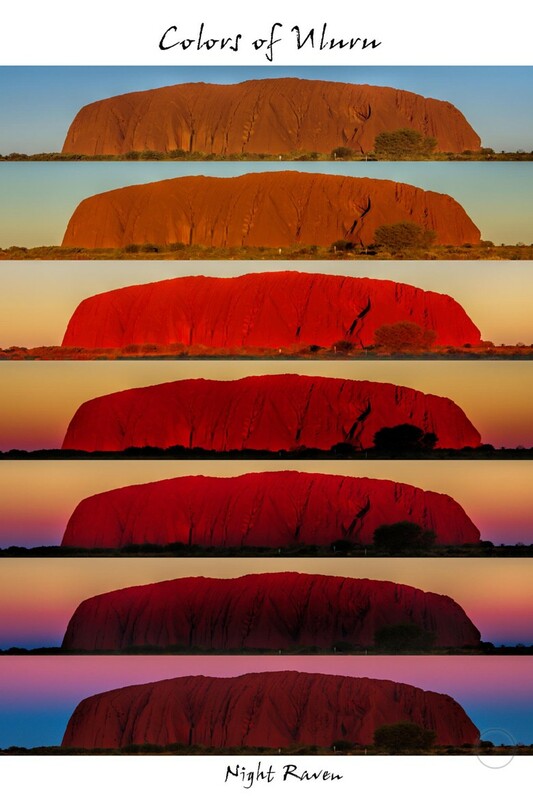 At such moments Uluru becomes more red and brighter than usual. 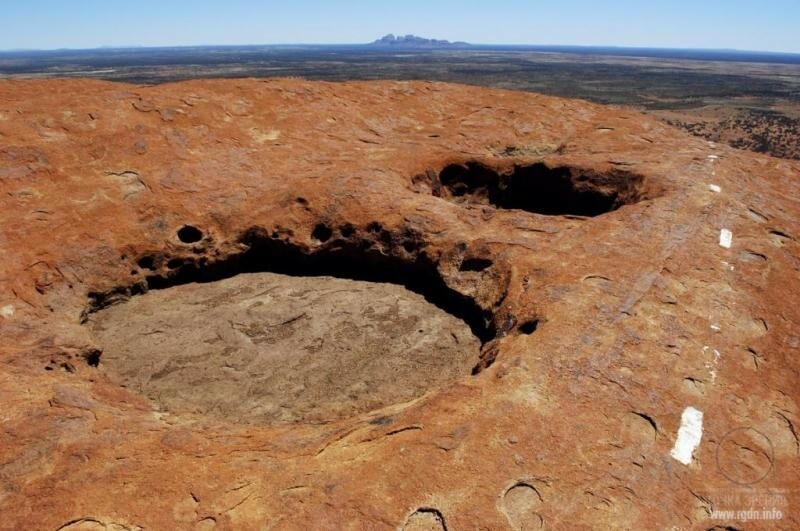 For millennia Aboriginal Australians have been worshipping this land and its relief as living idols. Sacred landscapes are the basis of their rituals and legends, since they regard the earth as a physical manifestation of Dreaming – the timeless point when the world was created. 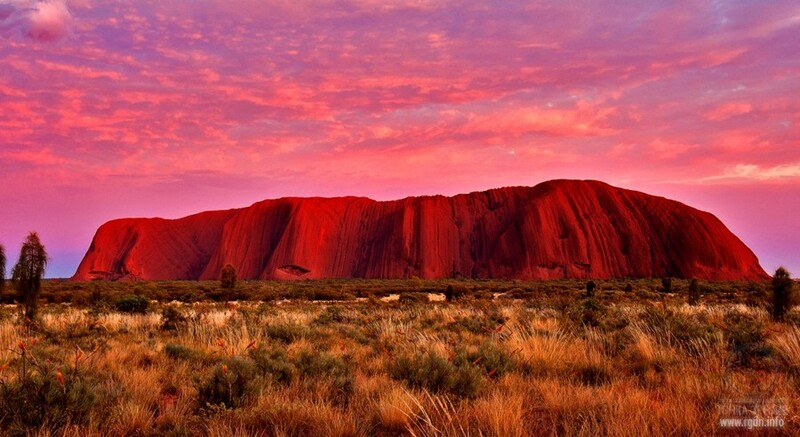 Aborigines believe every sacred site, including the mystical Uluru mountain is endowed with a special power. 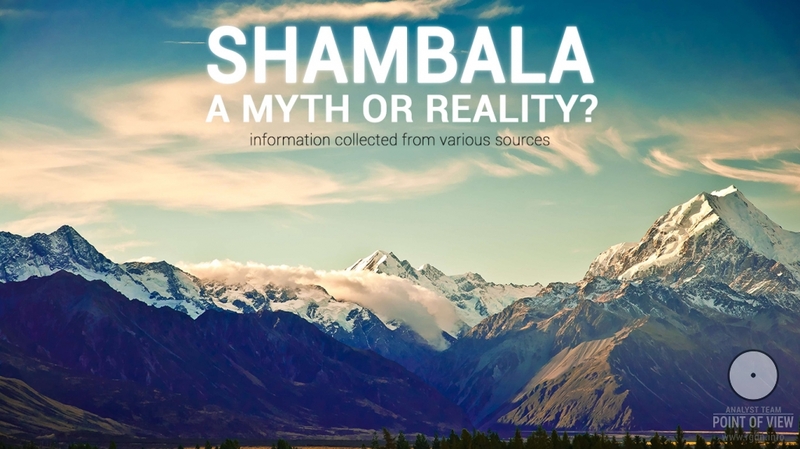 Each tribe is responsible for preserving several sanctuaries dedicated to feats of various heavenly heroes, or spirits of Dreaming – the mythical beings who created the earth. A sacred site is selected and outlined based on the legend of a relevant spirit of Dreaming. In Aboriginal myths Uluru is at the intersection of a number of sacred invisible paths (ivara) that traverse Central Australia. The paths preserve the memory of journeys and deeds of demiurges whose souls, according to Anangu beliefs, still reside in the nature around. A special guard is entrusted with protection of the energy of each sacred site. He leads all rituals, is the keeper of songs, and calls spirits of Dreaming when rituals are performed. Local tribes believe Uluru represents a door between the world of people and the world of spirits. Aborigines have been performing their rituals near the mountain for ages, and their attitude to Uluru has not changed until today. No aborigine dares to ascend to the mountain top, for it is regarded as a terrible sacrilege that can draw the anger of spirits on such person. The Anangu tribe is considered to be descendants of those beings who created the entire land around Uluru. 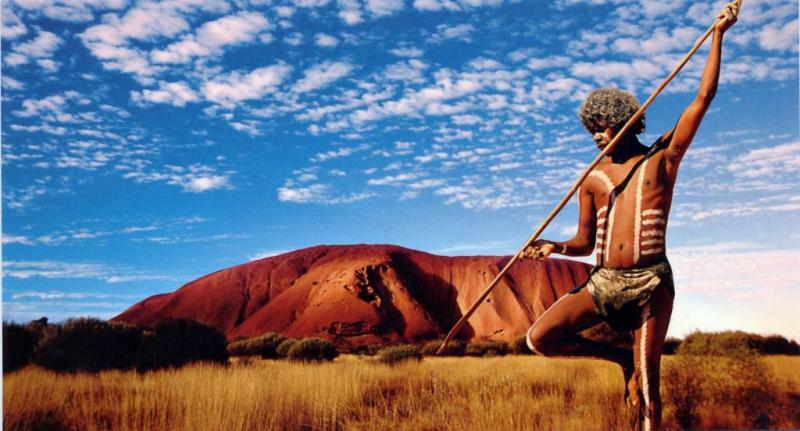 Anangu duty is to guard the land and eliminate its physical and spiritual pollution, therefore the aborigines oppose ascents of tourists to the mountain top, and most visitors respect their sincere convictions. Aborigines keep warning Uluru still takes away human lives, and those who ascend the mountain will have, to put it mildly, troubles in the future. Some people don’t trust such stories, but regular mysterious accidents with impious tourists evidence the aborigines are mostly right. Uluru does possess a certain power beyond explanation of scientific understanding. Every year several daredevils who have ascended the mountain top die of heart failure. Another paranormal phenomenon sometimes recorded at Uluru is UFO sightings. 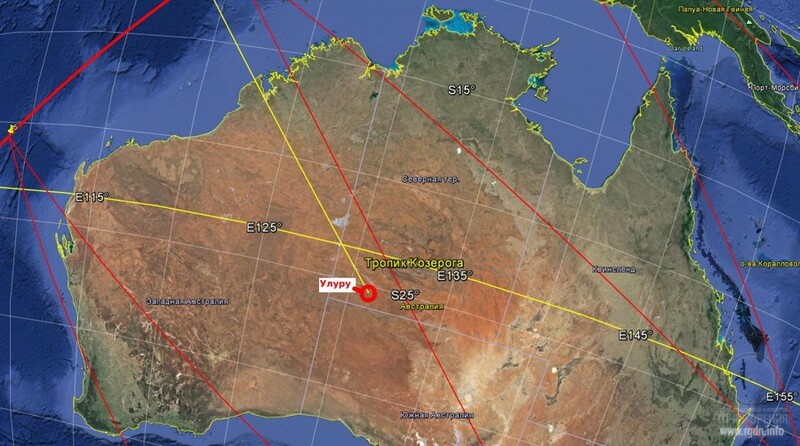 Strange flying objects looking as big triangles were recently observed there, according to both Australian astronomers and tourists. However, such objects were not detected by radars. If we superficially look at local myths and legends from a materialistic perspective, they represent funny stories of wild uneducated people. Yet, if we study them profoundly, a deep hidden meaning is revealed therein. As an example, let’s consider interpretations of some myths and legends. There are hypotheses that ancient megalithic structures may be located on our planet by a certain scheme (details are given in the Star. The Golden Ratio article series). Hundreds of researchers carried out studies in this field, and it should be admitted they made a good progress. 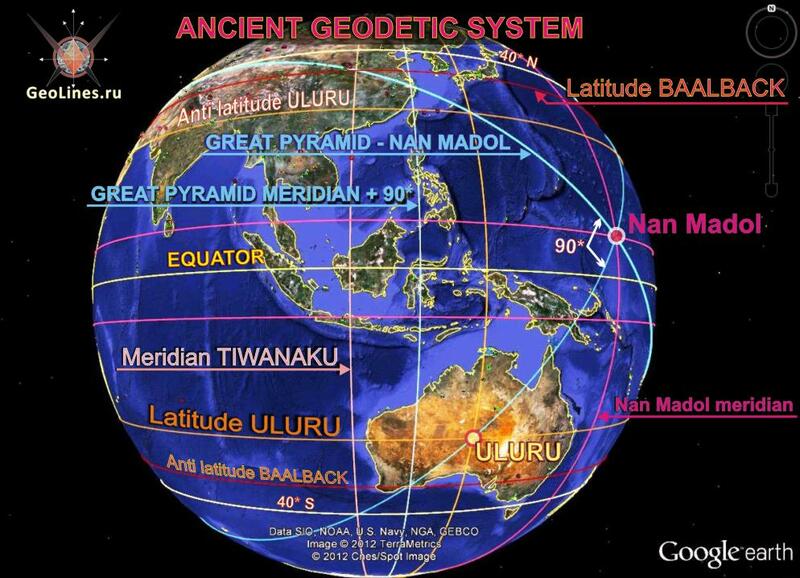 It has been ascertained that if we draw lines between the most significant ancient buildings and depict relevant parallels and meridians we will get a global network of alignments covering the entire planet. While studying this network, researchers have identified distinct patterns making it possible to state with certainty there is a certain system of placement of the pyramids, temples and other megalithic structures. As pivots for alignments, following the principle of monumentality, the most famous and significant historical sites have been selected. These are the Great Pyramid of Giza, Stonehenge, Teotihuacan, Tiwanaku, Easter Island, Nan Madol, Baalbek, Angkor, Lalibela, the religious centres of Jerusalem (Solomon’s Temple), Mecca, Vatican (Rome), Great Zimbabwe in Africa, the sacred mountain Uluru in Australia, Por Bazhyn and Vera Island megaliths in Russia. Through study, systematization and identification of the system construction principles is what should be done in the nearest future. 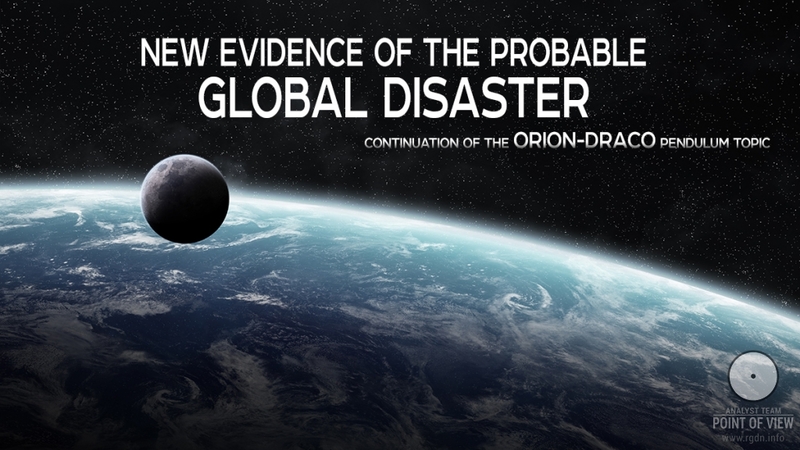 But so far the theories of paleocontacts and existence of an advanced ancient civilization on the planet get initial real proofs from the most incredible perspective. Quite likely, prehistoric buildings and structures are a part of an ancient geodetic or navigational system, where pyramids and temples, along with other functions, play the role of reference points nicely visible from space. Uncle Lewis Obrien, an Aboriginal elder with whom we were walking, gently put his hand on my shoulder and quietly said, “Arny, look over there, in the direction of the centre of the city. What do you see?” I told him that I saw Victoria Square, the noisy bustling business centre of the city. Hundreds of people were shopping; cars honked and buses moved slowly through the traffic. “Looks like a busy city,” I said. My environmental consciousness was shocked and enlightened. I realized how my view of the city was filtered through the lens of my U.S. background and education. Until meeting this elder, given the choice, I tended to avoid cities, preferring the countryside. Uncle Lewis made me realize that the miracle of nature I was looking for in the countryside was right in front of me, in the midst of the bustling city. The Dreaming is always present, like an aura shimmering around the objects and events you call everyday life. Some Aboriginal peoples describe the Dreaming in terms of the dark side of the moon. When the moon is not quite full, you see its bright, illuminated side. You might call it a half moon. But if you look closely on a clear evening, you can see the dark side, silently shimmering next to the more apparent bright side. Like me, most people focus only on the bright side and miss the moon’s dark face, that is, the Dreaming reality. The bright side is only that portion of the whole moon that is illuminated. Focusing only on the bright side of the moon and ignoring the dark side might easily make you think that the dark side does not exist, while in fact we need the dark side to represent the whole moon. Uncle Lewis showed me that the city’s reality exists because of the Dreaming. Without it, nothing would be. Dreaming is the energy behind everything; it is the life force of all living beings, the power of trees and plants, and the power of motors, business, and financial centres. An artist senses the Dreaming in the canvas, paper, and stone and knows that everyday reality is not only concrete. Leonardo da Vinci wrote that artists should look into peeling plaster walls until they can see images emerging from the shapes of the plaster. Similarly, Michelangelo called sculpting a process of bringing out the form that already exists inside the stone. Artists and aboriginal peoples have developed the ability to see the Dreaming, that is, the power behind figures you see in your nighttime dreams and everyday reality. 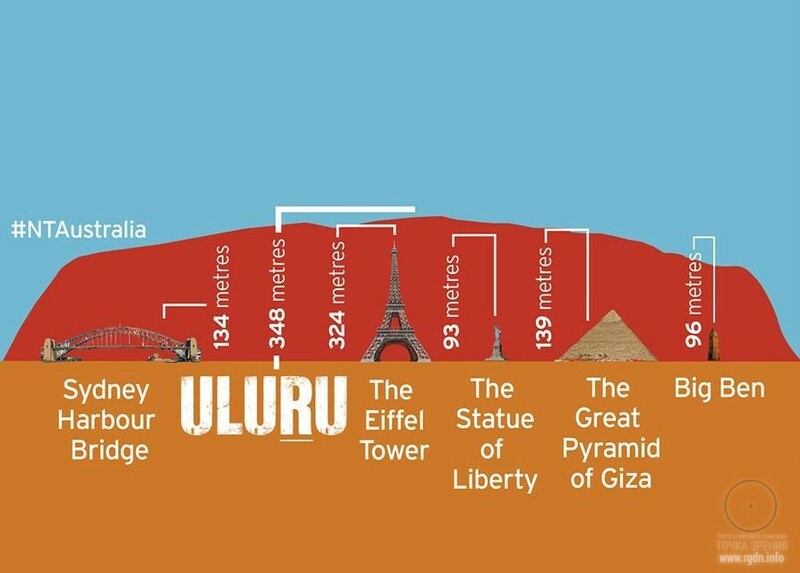 As a conclusion, we can say Uluru is simultaneously the so-called place of power and a reference point to mark ley lines. The indigenous Anangu tribe lives next to the mountain. They are simple nice people who live in harmony with nature and in peace with neighbouring tribes. In their culture they preserve deep knowledge of the human being and the world, of the universal laws and the meaning of life. All of us, likewise, have nothing preventing us from living just as peacefully and happily, in unity, harmony, and creation of beauty. Humanity has all the necessary knowledge for that already. We should only remember the main place of power is inside each human being, and everyone who desires can find it.